Democrat Stacey Abrams ended her run for Georgia governor on Friday, but she didn't give an ordinary concession speech, accusing her opponent of centering his campaign around voter suppression and calling the outcome an "erosion of our democracy." She claims her opponent suppressed Democratic votes, but there is no evidence for this. 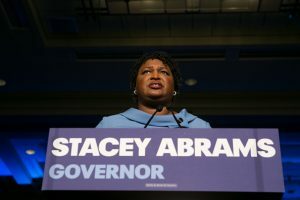 Abrams and her allies point out that large numbers of people have been removed from voter rolls—1.5 million Georgians since 2012—but their contention that Kemp "purged" these names as secretary of state is false. The state’s "Use It or Lose It" law, passed in 1997 by a Democratic legislature and signed by Democratic governor Zell Miller, requires that voters who don’t vote or otherwise respond to requests from local voting offices to update their registration status be deemed inactive. This ensures that people who’ve died or moved away can no longer "vote" in state elections—i.e. that their identities can’t be used for untoward electoral purposes. The Abrams campaign alleges that the number of voters purged spiked in 2017, when 107,000 voters were declared inactive. But the secretary of state’s office points out that the biannual voter-roll maintenance didn’t take place in 2015 owing to a legal challenge and so there was an unusually high number last year. She continued to blast the election as "tainted" in a CNN interview on Sunday, and fellow Democrats like Hillary Clinton, Sen. Sherrod Brown (D., Ohio), and Sen. Cory Booker (D., N.J.) used heated rhetoric in the week before her "concession" to say she was cheated. "If she had a fair election, she already would have won," Clinton said Tuesday night at the University of Texas. "I think that Stacey Abrams’ election is being stolen from her, using what I think are insidious measures to disenfranchise certain groups of people," Booker said at Yahoo Finance's All Markets Summit on Tuesday. "If Stacey Abrams doesn't win in Georgia, they stole it," Brown said Wednesday at the National Action Network. "It's clear. I say that publicly. It's clear." Yet Clinton herself ripped 2016 opponent Donald Trump when he infamously remarked at their third presidential debate that he wouldn't necessarily accept the results of their race. "I'll keep you in suspense," he quipped, leading Clinton to respond that such rhetoric was "horrifying." "Every time Donald thinks things are not going in his direction, he claims whatever it is is rigged against him," she said. "We've had hot, contested elections going back to the very beginning, but one of our hallmarks has always been that we accept the outcomes of our elections," she told reporters after the debate. At a Florida rally after that debate, she condemned Trump's comments again and said, "we have free and fair elections and the peaceful transfer of power. That is one thing that makes America great."